iClock990 time attendance and access control terminal adopts ZKFinger 10.0 fingerprint algorithm to improve identification speed. iClock990 features high performance, high image quality optical fingerprint sensor. The iClock990 can be used in multi factor authentication that supports fingerprint, password, Proximity and Smart card. It also has an option for Wi-Fi and GPRS connectivity. iClock990 has camera and 3.5" color TFT-LCD display, so it can display the individual graphical interfaces and personnel color photos. 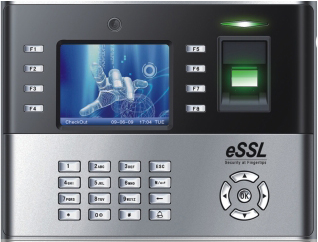 It comes standard with TCP/IP, RS-232/485, USB-host, USB-client, 8 functions keys, T9 input method, backup battery and has access control connectivity for Wigand-in, Wigand-out, Door lock connection, Alarm, Bell, Remote to Exit switch. Stores up to 3,000/10,000 templates and 50,000/80,000 records.